There are a lot of green tomato's in our garden right now, and almost every day I've been checking for a red one. Well, last week, there was a red one! And, a good size one too, and it's a beauty, too. It stands alone amongst all the green tomato's. I didn't pick it the second I saw it because I wanted to show some of my friends how it looked hanging there on the vine, all red. They were excited too and it felt good to me to have them share in my joy. It may just be a tomato, but we planted the garden together and enjoy the harvest together. I've been thinking a lot lately about the disciples and what it might have been like for them to follow Jesus. To take a stand and be like a red tomato amongst all the green ones. To move forward when He calls, even if I won't blend in. My husband and I listened to a book, Radical. It was so good I decided to purchase the book and read it. I've been working my way through it and there's a section I found very helpful this last week because of my own circumstances. Because I feel like a red tomato. In the book he was explaining the unusual ways that God works, and as His follower, am I prepared for that? In Luke 9, Jesus asks a man to follow Him. The man replied, "Lord, first let me go and bury my father." But, Jesus basically said no to him. Jesus wanted him to come right then and there. Drop everything and obey. Don't look back, don't wrap it all up, just follow! Another guy said he wanted to follow Jesus, but first he wanted to say goodbye to his family, but, same thing, Jesus didn't want him looking back. This might all seem like an odd and sad way for God to work, but God asks us to deny ourselves. He asks me to deny myself, and to follow Him. He doesn't care about what the crowd looks like, what the IN color is, or how I might want to finish things up. He cares about my devotion to HIM. He wants me to match Him. My reflection to stand out in such a way that He will be seen; it may very well seem odd. 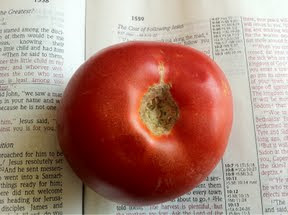 So today Jesus, continue to mold me into that one tomato for You. The kind that stands out on the branch and is sustained by the vine. Say That Again, Jesus, You are asking more of me and it is different, I will choose to obey.